Create wall-to-wall beauty in your home with new carpets. Visit our expansive showroom to see our large selection of new carpet flooring in Greenville, SC. Upgrade the flooring in your home with a modern look and feel that makes an impact. With our broad array of colors, styles, and textures, you are sure to find the right flooring for your next home renovation project. Achieve the cozy or modern look you have always dreamed of in your home by working with one of our experienced design specialists. We ensure that your floors match your home décor and your preferences. Achieve the cozy or modern look you have always dreamed of in your home by working with one of our experienced design specialists. We ensure that your floors match your home décor and your preferences. Whether you are searching for lush carpet for your guest bedroom or durable outdoor carpets for summer fun on the patio, our showroom has the option you want. We also offer a wide selection of area rugs at our showroom. Rugs allow you to have the best of both worlds if you love hard surface floors but you still want the benefits of carpet as well. With a number of different rugs to choose from, you are sure to find the texture, pattern, and size that perfectly suit your home. The great thing about our area rugs is that they add unique style to any room. Instead of having a uniform floor throughout your home, you are able to create diverse designs that change to suit the décor. You are given more freedom to create the look you want your room to have. Best of all, area rugs have many of the best benefits of carpets. They keep your room warmer during the winter and give you a comfortable place to rest your feet. You can’t go wrong with a well-crafted rug to really pull the entire room together. Visit our showroom today and take a look at what we have to offer. Choose the right carpeting for your style when you shop with our flooring experts. We eliminate the guesswork by listening to your needs and then suggesting the ideal flooring options to meet them. Our design team shows you the best options for the particular room you want to renovate, so you get the best value and lasting quality. We are dedicated to your ultimate satisfaction – whether you’re browsing, ready to select a floor, or you need professional flooring installation. Ask about our Ultimate Confidence Guarantee that comes with our products and services. If you suffer from allergies, our carpet store is the place to be. Contrary to popular belief, carpeting has actually been shown to be beneficial for allergy sufferers. It is able to trap pollutants in the pile until they are safely vacuumed up. This means that allergens are never allowed into the air, making your carpeting act like a kind of air filter for your home. Carpeting also creates a safer environment for the very young and the elderly. The majority of falls happen around the home, but you are able to help eliminate most of the impact by choosing a soft flooring solution. Carpet helps to break falls that young children and the elderly often suffer from. Best of all, because of the surface texture, carpet reduces the chance of slipping while walking around the home. Lay a solid and soft foundation for your active family by choosing from our selection of beautiful Berber carpet. This luxurious carpet can vary in pile height depending on the room and your preference. Whether you choose the low pile, a tightly constructed variety, or the more luxurious high-level pile, you are sure to get a floor covering that is ideal for heavy-traffic areas. Save time and money by choosing a carpet that provides reliable strength and innovative soil-hiding capabilities. Berber carpet can be constructed as a level-loop or multi-loop carpet depending on your particular needs. 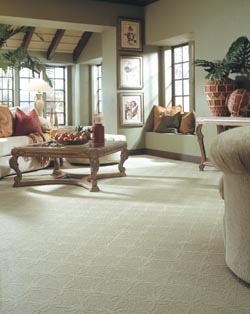 Let our knowledgeable floor sales team answer any questions you may have about Berber carpet. Get the assistance you need from the trained professionals at our carpet store. We want to help you make the best decision on flooring in your home or business. As a local store that is a member of one of the most reputable carpet franchises in the nation, we place a premium on exhaustive design training for all of our employees. This helps our customers get the best carpet options for their particular needs. Every home is different, and each family needs a carpet that caters to their unique preferences. We help you make the right choice for each room with a broad array of advanced carpet and flooring products. Matching the right carpeting type with your family is an essential part of our process. We also offer flooring made from polypropylene, olefin, and cotton. This helps you avoid problems with allergies. When you want to be absolutely positive that you have made the right choice for your flooring needs, come to our store. We keep you covered at every step of the process by providing personalized customer services and product/service guarantees. In addition to getting the most value for your flooring investment, you need our affordable approach to carpet installation. It is vital to have your flooring installed right the first time. Carpeting required precise cuts to help it look its best. If you remove too much it will leave noticeable gaps, but cutting too little creates lumps that you can’t get out. Our experts have the skills to make sure the job is done to the professional level of quality you expect. Even the highest quality carpets look bad with a poor installation, while an affordable roll of carpet could be made to look its best with a great installation. That is why it is important to trust our experienced team for all of your carpet installation needs. We focus on your complete satisfaction with every part of our process, and that includes ensuring the right fit for every room. Our rates are competitive, and your carpet will stand the test of time. Take advantage of the incredible savings we are offering on all interior and exterior carpeting for your home. Get the look you want by depending on us for dependable and precise flooring installation. Contact us for all of your carpeting needs. We proudly serve the communities of Greenville, Spartanburg, Easley and Anderson, South Carolina.